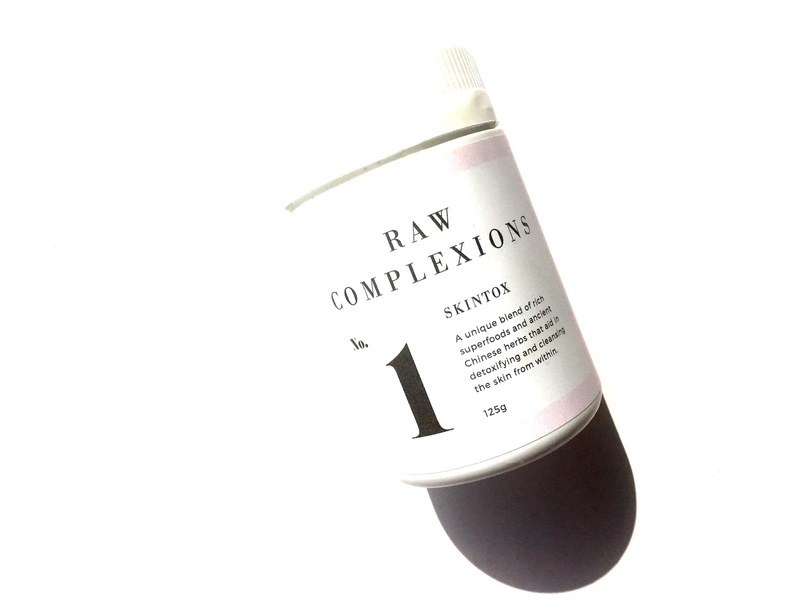 PRODUCT REVIEW: RAW COMPLEXIONS SKINTOX BEAUTY FOOD. Lately I have been trying too incorporate more juices and smoothies into my routine and I have noticed that they have made a significant difference to my skin and of course my health, in doing so I have started to become obsessed with using different supplement type products. I was so happy when the Skintox Beauty Food from Raw Complexions hit my desk because it's kind of like a hybrid of a beauty product and a supplement. The nutrient rich powder fits easily into your daily routine, you just add one tablespoon into juices, smoothies, raw desserts and it can even be sprinkled on top of cereal and yoghurt. I personally like mine mixed into my smoothie, I normally put spinach, bananas, blueberries, almond milk and a tablespoon of powder into my magic bullet. In regards to taste it has a quite sour note to it, I think that might be from the pomegranate, I personally like the flavour and it just blends easily into of my juices and smoothies. It contains ingredients like Flaxseed Meal which contains omega 3 fatty acids which work to hydrate the skin and also provides protection from free radicals, Bee Pollen is rich in 12 essential vitamins, 8 amino acids, 30 minerals and enzymes that all work together to rejuvenate the skin, it also helps with the skins natural cell turnover process which in turn stimulates collagen and elastin, also contains antibacterial and anti inflammatory properties, Schizandra works to detoxify the liver, Amla Berry works to remove toxins and strengthens and supports immunity of the skin, Camu Camu contains one of my personal favourite ingredients Vitamin C and Beta Carotene which all work to promote collagen and elastin and also work to improve skin tone, texture and clarity, Pomegranate works to protect the epidermis and dermis of the skin which in turn helps with cell regeneration, it also contains antioxidants, fatty acids and punicic acids which work to protect the skin against free radical damage and will help to prevent and fade pigmentation. Not gonna lie, that all sounds pretty amazing to me! I do really believe that as part of our beauty routines we need to be nourishing our bodies from the inside out and this powder makes it easy to do so. Like I said earlier I have noticed a big difference in my skin and health when using this product. For more information on Raw Complexions Click Here.